Give me a brief history about Philartiste. That's me for my email & "socializing" webistes ! lol. I put the Phil with "artiste" (French for artist) and it stuck I guess. Normally I go by Phil, Philly, Phil One or Mos One (my original graf tag from the 80's, which I recently began to "dabble" with again...Oh nooooo! lol) Like many kids, I loved to draw (especially the detail of the buildings in the NYC skyline) and watching cartoons. I've never attended or gotten a formal 4 year art/design school degree. Throughout the years, I took after-work evening classes at Pratt & FIT in NYC. For the most part, I'm all self-taught. I don't know if I've been a good teacher tho ! lol. 4 years ago, I freelanced for a year at the same company that I work at currently. I was blessed and given a chance to become a full-time comp/graphic artist at a children's apparel company out here in New Jersey. Your work on sneakers is official. What do you like most about sneakers and why? Thanks so much ! That means a lot, for real. I like the fact that it's another blank canvas to paint on. In some ways it's like a painting a portrait of the person. Everyone wants their own colors, graphics and individual flavor. 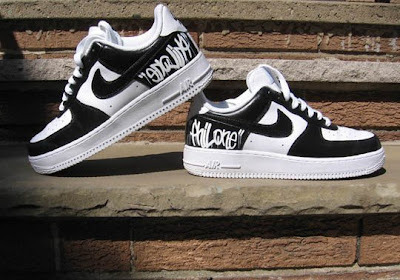 I think no matter what designs the "big" sneaker companies release, it proves a sneaker or footwear design can never be truly "customized" unless it's hand-painted at the request of the customer and that's a very cool thing. You're into all forms of art. What do you enjoy most about art and the way artists express themselves? I'm fascinated by seeing different mediums other artists use and their techniques. I enjoy it all, including photography. The individuality that comes across, the interpretation. What is seen thru a particular artists "eye" and the way they see things, the insight of that person. It's like "Here, this is how is see it....". That's really special and even more so, if you can watch art being created in front of you. Recently, I've become interested in blending colors and how to create that effect on canvas. Any chance I get I'll always ask "How...? Always discovering and learning. I also dig illustration & animation. It's great that we met at a hip hop show. How has hip hop influenced you in your life and maybe in your art? I love the vision, the individuality, and the story-telling aspects of it. It's about not being afraid to put yourself and what you do out there for others to see. Like yo "Check this..." which I think is the graff part of it. Growing up, out there having fun painting at night I was out in Queensbridge & Long Island City.That explains why I'm a huge Nas fan. I'll paint listening to 90's hip-hop at home all night.... and most times into the early morning ! 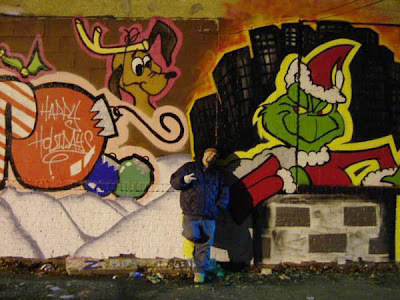 It was great going back and rockin' my first piece in 20-something years at 5Pointz in LIC this summer. Meres,(an amazing artist himself)who runs the place, has the sound system pumpin' out there all day/night during the summer. Can't forget my classic rock, 80's metal, 90's grunge, blues & jazz either, tho. Do you have any upcoming shows? Please do tell! I'm working on 2 new pieces for the New York State of Mind 2 show which will probably be in May sometime. Last year at the first NYSOM, was where I met alot of new artists and life-long friends. For me to have my work run in this years line-up, with my art fam, will be special. I'm excited about showing the new pieces cuz I stepped out and tried something different. It's been extremely challenging for me, so I'm hoping everyone will dig it. Hopefully I can be a part of more shows throughout the year. 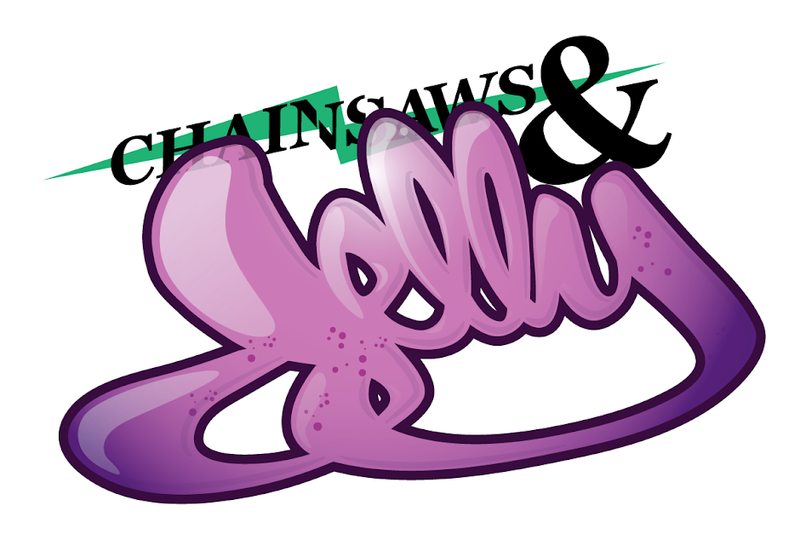 No doubt, I'll keep you posted here on C&J ! lol. I think it'd be cool to put a show together out here in Jersey with some friends too ! That was cool because I don't go out much, since I paint alot. That was my first night out in a while and first hip-hop open mic-showcase ever. It was a pleasure meeting you & Daniel Joseph ! NJ has shown me nothing but love, since day one. Being from the city, diversity is a given. You hear alot of stuff, but you have to get out and see places for yourself. I'm a freight train/modeller nerd too, lol so it's been cool seeing them all over out here.lol. There's so much more to explore out here, especially the art & graff and train history. 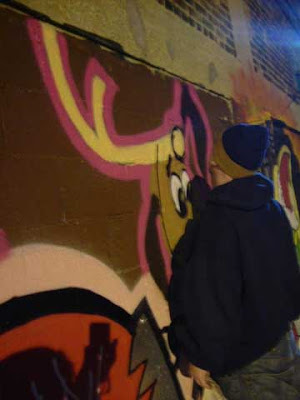 I've painted out in Plainfield a few times, so far and hopefully I can paint some more this summer. Bayonne and Plainfield kinda remind me of Queens, Brooklyn & the Bronx. Yes,I know you and you how you rep & push Jersey! I got mad respect for you on that and your creepiness vibe. I'm really looking forward to attending the Red Velvet show in Newark! Tell me about the XMEN. XMen is a world-wide crew of artists that was founded by it's original member and artist, Tatu,out in Brooklyn in 1979. 30 years, male and female artists alike, all over the world still grinding! I grew up seeing TESS, DJ NO & CHINO XMEN tags and stickers all over the BMT trains in the city as a kid accompanying my Mom to her workplace. It was like on every subway car, every day...lol. They were really the ones who started the whole sticker phenomenon, before today...in the 80's. To have,Tatu Xmen put me down with them last year was a real honor. 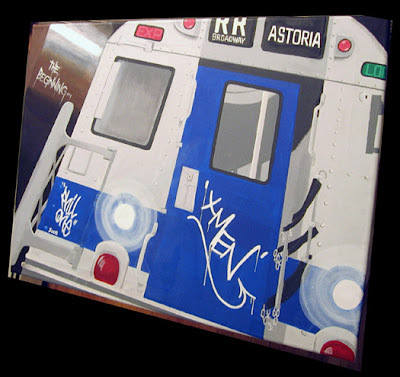 What was even more special for me, was the love the all old school writers showed for "The Beginning".It's a canvas depicting the front of an old school BMT "RR" subway car piece that I put in for Tatu's aunt's XMen benefit show at Alphabeta last November. I wanted to take everyone back to better days on that one and the reception it got was exactly what I intended. Memories. Last but not least, what would you want to add to this interview about yourself? I'd like to add.....A big thank you to you, She, for the polite conversation! Thank you to ALL the artists and friends that inspire me & that I consider (and have yet to meet) my extended family,especially these last 4 years. XMen Worldwide, GFC, Younity, TD4, Bronx Art, 5MH, TVS familias. My sister Christine, niece Caroline, bro-in-law Bill & my family in France. A special thank you to my mother & father (R.I.P) I will remember & love you always. Peace ya'll.